Organic soapberries (also referred to as soap nuts, although not actually a nut) are a natural, multipurpose, hypoallergenic, grey water safe, palm oil free, plastic free, cost effective household cleaning solution that works! The soapberry is the seed pod of a berry containing a very high percentage of saponins, a natural surfactant. The soapberry shells are placed into your washing machine instead of detergent and fabric softener, and will leave your clothes clean, soft and without scent. 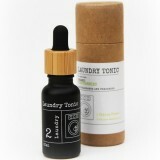 If you prefer a little scent, add a few drops of That Red House Laundry Tonic before washing. 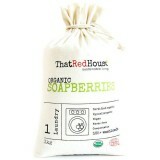 Use soapberries to wash clothes, wash dishes, as a general cleaner, hand or body soap, shampoo, and much more. Read our blog post for seven ways you can use soapberries around the home.